There have always been scammers out to empty your pockets, but with the age of the internet, they’ve managed to get even more clever into tricking you out of your cash. Your identity is valuable. Fraudsters know this. They can use the information you share online to pretend to be you and apply for bank accounts, mobile phones, loans or a wide range of other products or services in your name. As a victim of identity fraud, you might not realise you’ve been targeted until a bill arrives for something you didn’t buy, or you experience problems with your credit rating, for example. To carry out this kind of fraud successfully, fraudsters usually have access to their victim’s personal information, which they obtain in a variety of ways – such as through hacking and data loss, as well as using social media to put the pieces of someone’s identity together. Did you know 88% of fraudulent applications for bank accounts and financial products are made online? So, what can you do? The answer is loads!… here’s a few to be getting on with. They may show a card which claims to be a “Pedlars Licence” or work permit. A bag of household products (including the typical tea-towels!) is supplied at a minimal sum by the person who employs them. Once they sell enough to cover the cost of the products they get to keep anything else earned. The price for whatever has been purchased usually comes to a note; usually £10. The householder disappears to get the money, this is when the scam begins. When the note is handed over, the lad examines the condition and how long it took the person to get it. If it is crumpled, they accept it and move on. If it is crisp flat and new, they are much more interested and may engage the person in more conversation, to obtain details about them. As they leave they will smell the note. If it is slightly musty, this is an indication that there is more in the property. Those addresses are noted. The addresses of elderly / vulnerable / gullible people are all noted. These lists are purchased by all sorts of people including; tarmaccers, tree workers, roofers, dodgy builders etc., and can be shared amongst the travelling community. Once on a list, your address could be sold on and on. Hence the repeat nature of these persistent callers. As part of Operation Snap, members of the public can submit (via a secure online form ) digital footage showing potential traffic offences. This can range from driving dangerously or carelessly to overtaking on solid white lines, using a mobile phone while driving, ignoring traffic lights or dangerous driving around other road users, such as horse riders and cyclists. 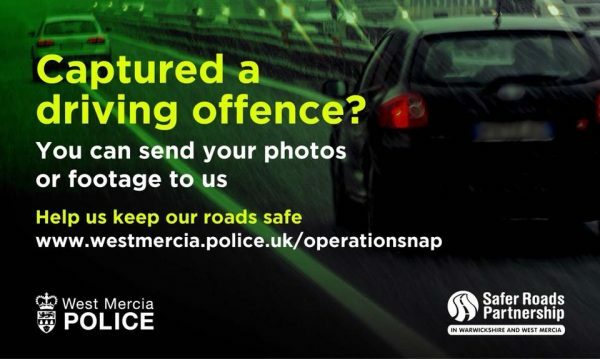 Your submission will be sent to West Mercia Police and Warwickshire Police where the evidence will be reviewed by one of our road traffic officers, who will enforce against any offences committed. Any footage submitted through the portal can also be used by us to help educate other road users and to advise on case results. Is crime harming your community? If you have any information about criminal activity and you know who is responsible but you feel that you can not go to the police because you are scared that it would mean going to court and giving evidence, or you are scared of what might happen to you or your family if those responsible find out? You can contact the independent charity Crimestoppers on 0800 555 111 and tell them what you know. You will remain 100% anonymous. Just tell them what you know, not who you are. Do you know about the EmergencySMS service? It is a valuable tool that can be shared with our communities, partners and even families and friends. It assists anyone who may have communication difficulties with contacting the police or other emergency services. The service is free and allows you to use text messaging to get in touch with any of the UK 999 services (police, ambulance, fire and rescue or coastguard). It is available for anyone who finds making a voice call difficult, has communication difficulties, is deaf and includes members of the autistic community. Organisations with which you have an ongoing relationship, for example those who regard you as a customer, (or in the case of charities – a donor) may well gather your consent during the early stages of your relationship with them and will therefore be entitled to call you even if your number is registered on TPS, unless you have previously told them specifically that you object to them calling you for marketing purposes. The TPS can accept the registration of mobile telephone numbers, however it is important to note that this will prevent the receipt of marketing voice calls but not SMS (text) messages. If you wish to stop receiving SMS marketing messages, please send an ‘opt-out’ request to the company involved. Alternatively you can phone the Registration Line on: 0345 070 0707. You can call this number to register your number, discuss your concerns or request a complaint form to report receipt of unsolicited direct marketing calls.